Rob Pearce seen here with his own band – Mardi Gras at Farnborough Jazz Club (Kent) on Friday 24th June 2016. Photo by Peter Marr. Another Friday is fast approaching (FRIDAY, 10th AUGUST 2018) and you are wanting to know who we have booked for you at FARNBOROUGH JAZZ CLUB, yes? 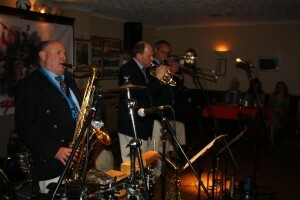 Great news, it’s the marvellous ‘MARDI GRAS JAZZBAND’. Keith and I love them, because they are always full of fun (well they’re not called the Mardi Gras for nothing). They play a mixture of jazz for all preferences. 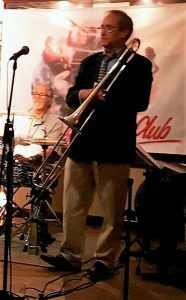 I said last time, band leader (trombonist) ROB PEARCE, is a frequent visitor of New Orleans, really ‘living’ his jazz. Rob again, is joined by LEIGH HENSON (trumpet), plus JOHN ELLMER (reeds by the dozen), JOHN STEWART (banjo & guitar), STEVE SMITH (bass) and PAUL BAKER (drums). Come on over to Farnborough Village. We are in the Sports Club and will be enjoying ourselves with a pint, or two (etc) of Shepherd Neame’s brew. We have a great atmosphere here, have a free carpark. So, don’t be shy, come and listen and for still only £10, see how we keep young here. UNDER 25YR OLDS – IN FOR FREE limited period! This entry was posted in Mardi Gras JazzBand on August 9, 2018 by Diane. 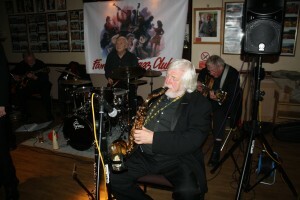 Hey, all you lovely jazzers, the FARNBOROUGH JAZZ CLUB (Kent) is up and running again and I bet you have missed us too. So we expect you all to come pouring through that door this coming Friday, 2nd February, 2018 to enjoy the fabulous ’MARDI GRAS JAZZBAND’. 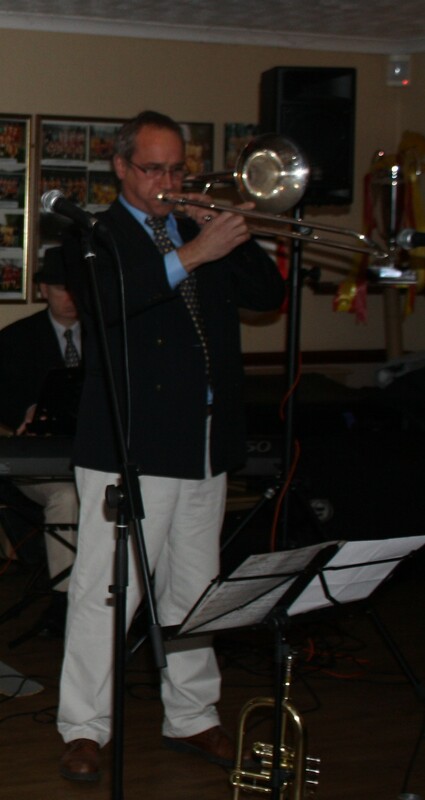 Rob Pierce on trumpet, Mardi Gras JazzBand at Diane’s 75th party 12 January 2018 at Farnborough Jazz Club. Photo by Mike Witt. 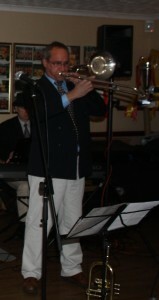 Trombonist band leader ROB PEARCE is back to start our club’s year off with his band and their wonderful top notch music. Oh by the way, a happy new year everybody. 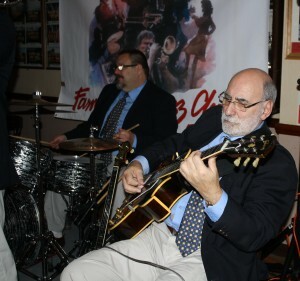 Rob’s super band will have LEIGH HENSON on trumpet, JOHN ELLMER on his many reeds, JOHN STEWART on banjo & guitar, STEVE SMITH on bass and PAUL BAKER on drums. You have had plenty of time to get rid of those naughty Christmas inches, but if not (and I certainly haven’t), you know what will help. Well practically all of you know we love to dance here, which is part of what makes for our happy atmosphere. That obviously includes a lovely little bar (with club prices) run by Ian, Kath and Barb. This entry was posted in Mardi Gras JazzBand on January 30, 2018 by Diane. 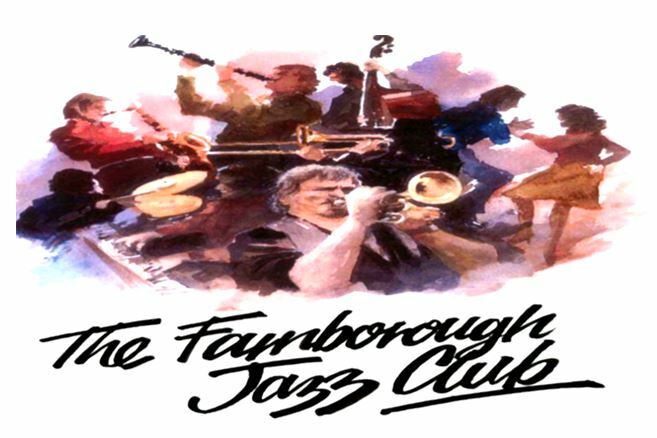 The ’MARDI GRAS JAZZBAND’ will be our band here at FARNBOROUGH JAZZ CLUB (Kent) this Friday, 8th December 2017. 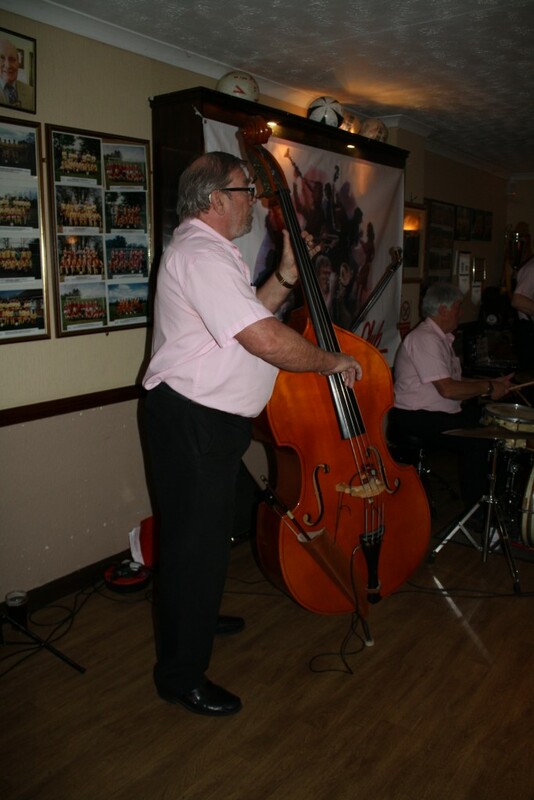 Trombonist ROB PEARCE (band leader) has booked LEIGH HENSON on trumpet, JOHN ELLMER with all his reeds, JOHN STEWART with his banjo and guitar,STEVE SMITH on bass and PAUL BAKER playing drums. After a fabulous evening last week, they have a brilliant act to follow, but Rob’s boys will have little trouble following, we have no doubt. So get down here, with your dancing shoes and be a part of the happy atmosphere we ALL create. This entry was posted in Mardi Gras JazzBand on December 7, 2017 by Diane. 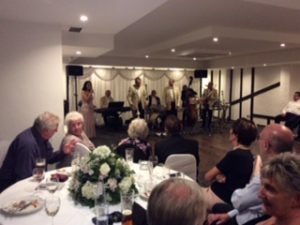 Mardi Gras JazzBand at Keith & Diane’s Wedding 8oct2017, Donnington Manor Hotel. 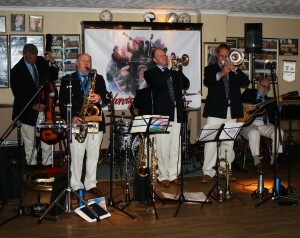 Band leader Rob Pearce-trombone, Leigh Henson-trumpet, John Ellmer-reeds, Jonathan Vinton-piano, Andy Lawrence-d.bass & Paul Baker-drums, Seen here sitting in – Keith on drums, Roger Curphey on d.bass & Diane singing ‘I cant give you anything but love’. Photo by Anje Jenn. Oh my, the cold nights are certainly drawing in since the clocks ‘fell back’, but not to worry, the ’MARDI GRAS JAZZBAND’ (the band we had at our wedding) will warm the cockles of your hearts if you come this Friday, 10th November 2017. 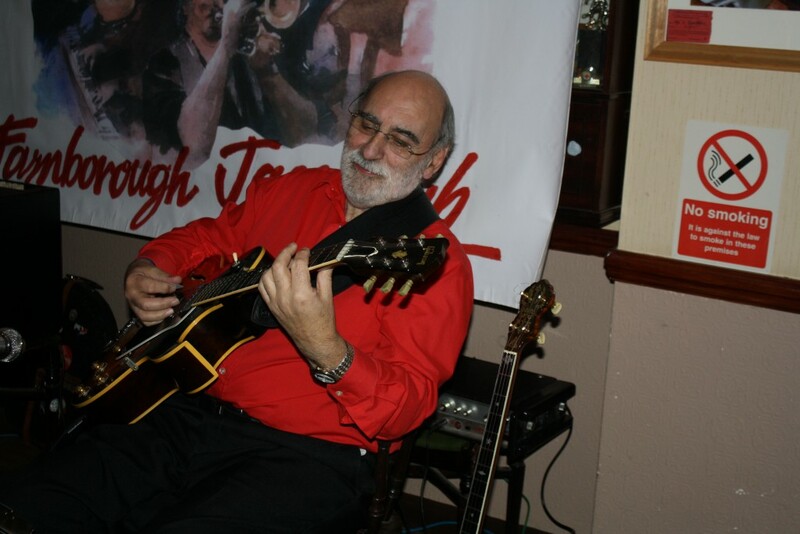 I know a lot of you will agree and join us here at FARNBOROUGH JAZZ CLUB (Kent), so it should be another cracking good evening to last you another week. Band leader trombonist, (and old married man) ROB PEARCE will be joined by LEIGH HENSON (trumpet), JOHN ELLMER (with all his reeds), JOHN STEWART (banjo/guitar), STEVE SMITH (double bass) and PAUL BAKER on drums – a lovely line-up. Any newcomers, just to tell you, we enjoy dancing, we have plenty of free parking and of course, lovely Shepheard Neame’s beer. P.S. We received our first anniversary card – married 1 month – with the sentiments, ‘and they said it wouldn’t last!’ (thanks Jean). This entry was posted in Mardi Gras JazzBand on November 8, 2017 by Diane. We have the ’MARDI GRAS JAZZBAND’ tonight, Friday, 29th September 2017. 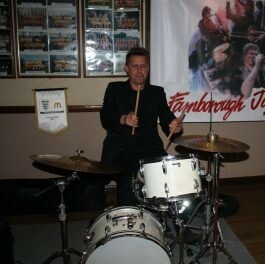 So get down here and join us at FARNBOROUGH JAZZ CLUB (Kent). What band of merry men do we have here for you? Well, trombonist & band leader (& newly married) ROB PEARCE, has booked PETE RUTHFORTH (trumpet), JOHN ELLMER (a conglomeration of reeds), plus I think a warm Farnbronian welcome to newcomer TOM BRIARS (sousaphone), JOHN STEWART (banjo/guitar), ANDY LAWRENCE (double bass) and PAUL BAKER on drums. So expect to hear some fabulous jazz. If you don’t, without a doubt, we’ll be saying to you next time we see you (as an old friend used to say), “Oh did you miss a gig”. See you all for an 8:00pm start – yes? This entry was posted in Mardi Gras JazzBand on September 29, 2017 by Diane. Brilliant – the guys in the ’MARDI GRAS JAZZBAND’ have agreed to play for us again here at FARNBOROUGH JAZZ CLUB (Kent) on Friday, 12th May 2017. Keith and I always enjoy them because they really make the evening swing. 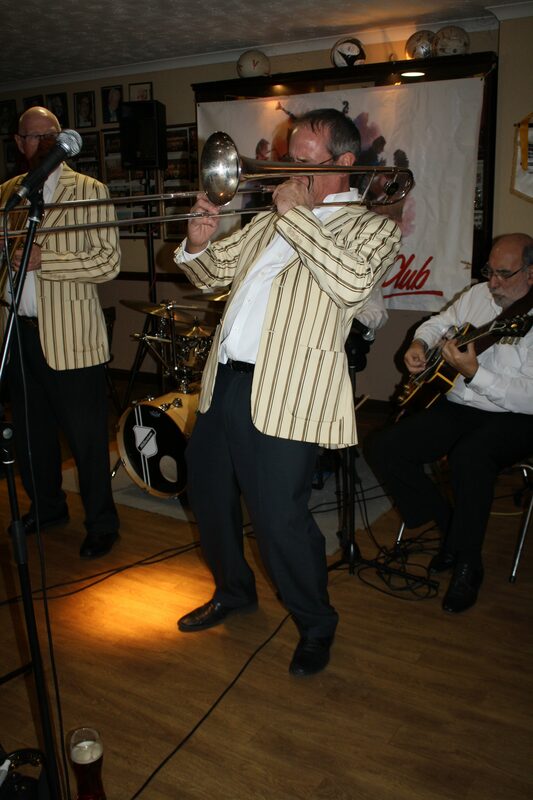 Trombonist & band leader ROB PEARCE, will have with him vocalist LEIGH HENSON, on trumpet, JOHN ELLMER on reeds, JAMIE PARSONS on piano, DAVE MOSES on double bass and not forgetting PAUL BAKER on drums, now how’s that for a great line-up. So see you all for an 8:00pm start. 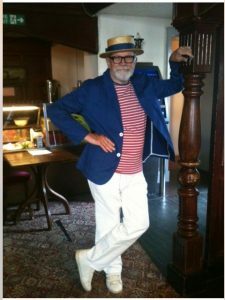 Before I close, I just want to tell you of the wonderful party a lot of us went to yesterday (Tuesday) to celebrate Brian ‘The Hat’ Stout’s life. What a party it was too! I’m sure Brian would have been thrilled to know (that as he requested) Rima and his lovely family arrange and made sure it was such a great ‘do’. There were so many of his friends from the cycling clubs and the various jazz clubs too, joining in the celebration – we all really enjoyed ourselves, with many hats being worn. Now we know we have a dancer where he’s gone to – and if there’s no cycling, I’m sure he will quickly arrange for that too aye. This entry was posted in Mardi Gras JazzBand on May 10, 2017 by Diane.